Don’t Pay to Fix Problems You Don’t Have! 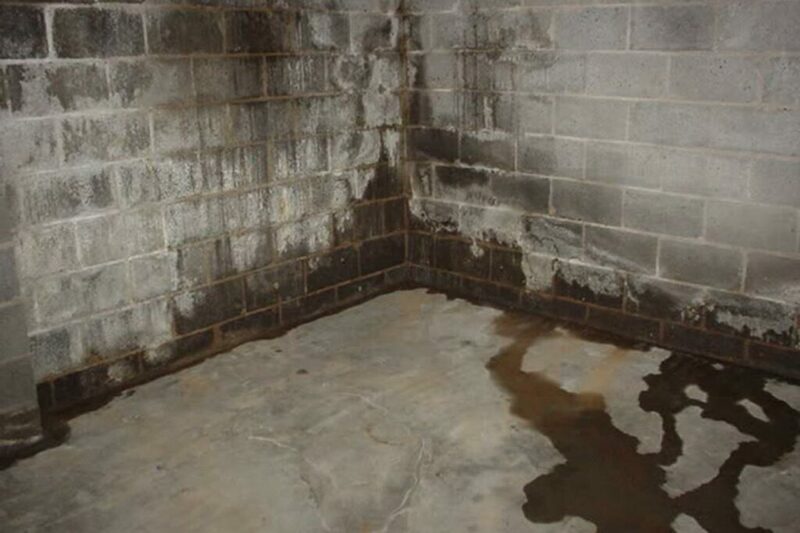 Here at Rooter Right Plumbing, we believe Basement Waterproofing is a process. We assess individual basements on a case–by-case basis. Doing this allows us to identify what we think is the MAIN CAUSE of your overall issue. Once identified, THAT PARTICULAR PROBLEM can be addressed. The problem with your average Basement Waterproofing Company is that they come in and want you to purchase every service they offer. At Rooter Right we like to identify step 1 and perform that task, and that task alone. If Step 1 solves your troubles then we end the project after step 1. Don’t let someone sell you on steps 2 through 10 if they aren’t necessary to solve YOUR problem. Get what you NEED from Rooter Right. Schedule a Consultation and see what options best suit your needs. 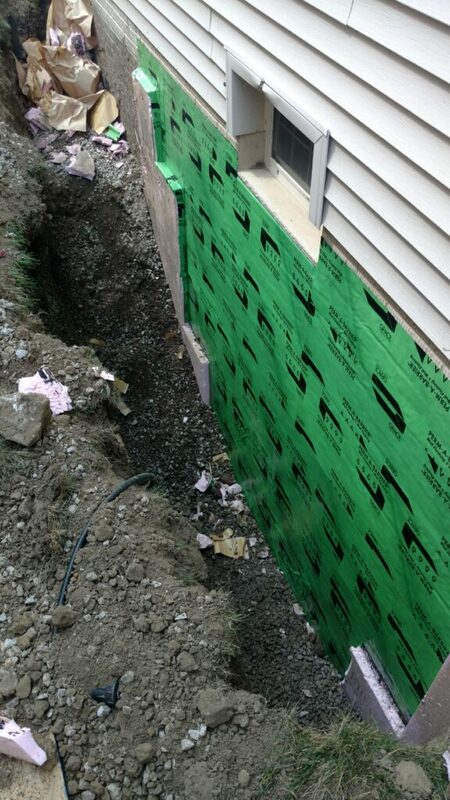 Diverting excess water away from your structure is the simplest way to try to prevent moisture issues in the basement. The grade of the soil around your house or business should fall away from the building directing surface water to flow away. You should always keep gutters and downspouts clean and debris free so they can properly direct rain away from the building as well. Try to eliminate obvious entry points for water. If there are cracked or broken blocks, bricks, or concrete have them repaired or filled. Foundation Tile is a circuit of pipe that runs around the perimeter of the Basement. 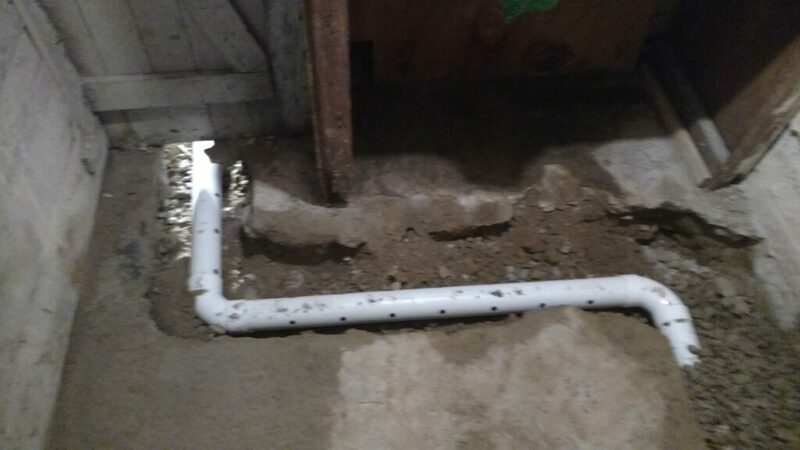 The pipe is buried just under the concrete floor, adjacent to the exterior walls of the basement, and is connected directly to your Sump Crock. Its purpose is to collect water that percolates down through the ground and deliver it to the Sump Crock to be pumped out via the Sump Pump. This process is designed to keep water from sitting on the walls and foundation of your home or business. Keeping Water from sitting on your walls and foundation is crucial to maintaining the structural strength of your building. When this system is in a state of disrepair, the water pools and collects around your foundation exposing it to potential damage from the water. When your foundation tiles aren’t functioning properly you can start to see water making its way into your basement. Usually the water comes in where your basement floor meets the basement walls. Another issue you could encounter when your foundation tiles aren’t functioning properly anymore, is water forcing its way up through cracks in your floor. Foundation Tiles are often neglected by Home and Business Owners, they seem to fall under the category of “out of sight, out of mind.” That is, until they are no longer functioning properly. As water percolates through the ground it tends to pick up sand and silt, the water then has the ability to deposit that sand and silt into your foundation tile. And just like any underground Drain Line, Foundation Tile Lines are susceptible to Tree Root growth and infestation. Both the sediment build up and the tree root growth can quickly lead to a system that no longer handles the excess water efficiently. Regular cleanings are the best way to make sure your foundation tile piping doesn’t fall into a state of disrepair. Snaking the lines with drain augers can help keep the tree root growth at bay and make sure there is a clear passageway through the pipe. High Pressure Water Jetting is the best way to remove sediment build up from the interior of the pipe. Rooter Right recommends you perform these services in conjunction with one another. Snaking and Jetting in tandem is the best way to clean foundation tile. Let the snake bore its way through loosening sediment and clearing the tree roots for the Hydro Jet hose to follow after. The Hydro-Jetter will then wash all of the sediment and cut up tree root debris back to the sump crock where it can be expelled from the building by way of the Sump Pump. 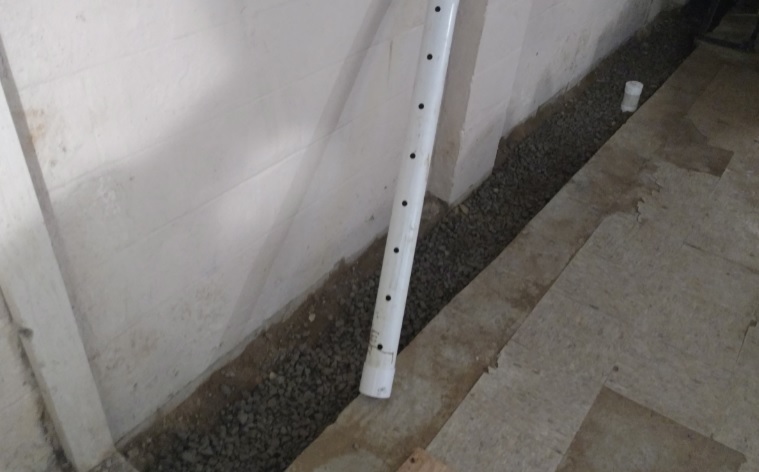 This combination does a great job in revitalizing foundation tile pipe, however, in some cases access to the pipe can be limited by multiple turns in the perimeter of the basement. Four square walls are ideal when attempting to clean foundation tile, unfortunately not all basements are square. With large basements and basements that don’t have a rectangle shape, sometimes it is necessary to add Cleanouts to the pipe in order to service it properly with the Snake and Jetter. Working from the sump crock alone doesn’t always allow our equipment to reach every part of the piping system. When this situation presents itself we add Cleanouts at strategic areas in the line. From these cleanout access points we can insert our snake and jet hose making sure every inch of the pipe gets cleaned. Unfortunately, some people find out about the importance of foundation tile maintenance after it is too late for a cleaning to resolve their issue. In some cases, settling of the house has “pancaked” or collapsed the pipe all together. When the pipe is no longer viable and cleaning just isn’t enough to get the pipe to perform its duty, we have to seek alternatives. In this case, the alternative is replacing your foundation tile. This requires us to cut and remove the concrete, approximately 15 inches wide, around the entire perimeter of the basement. Once the concrete has been jackhammered and removed we excavate the stone, dirt, and pipe leaving a trench all around the basement. The trench is filled with a bed of #6 stone on top of which perforated pipe is placed. 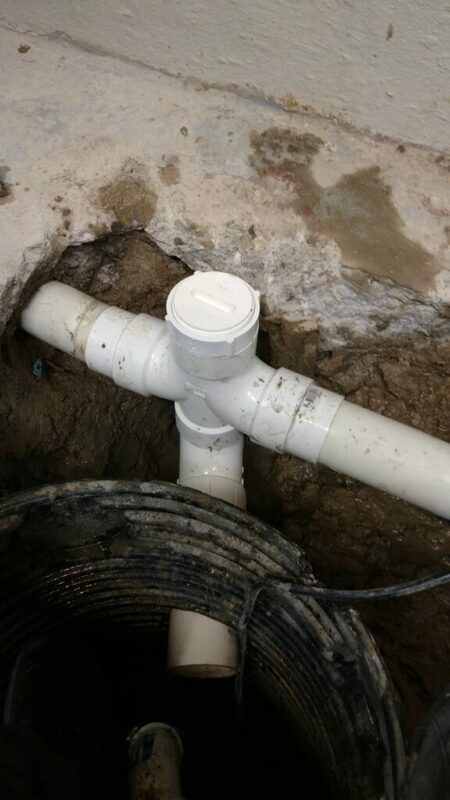 When installing new perforated pipe we add Cleanouts for future access and connect it to the existing Sump Crock. Once installed, the entire pipe is buried in #6 stone and the concrete is re-poured. Water issues aren’t always low at the floor/wall seam, sometimes water penetrates directly through a basement wall and you can see the water running down the wall to the floor. Other times you see what is known as efflorescence. Efflorescence is a chalky white mineral substance that can bubble and build up on the walls of your basement. This is caused by water depositing minerals and sediment as it evaporates from the walls. This is a tell tale sign of moisture penetrating the walls. The substance can be scraped off easily enough, however, scraping is a cosmetic repair and does nothing to address the cause of the problem. When one wall, or all of the walls, have water readily penetrating it may be time to address the issue from the outside and stop the water from making it in. In these instances Rooter Right will have a team of Professionals Excavate the Foundation Walls and perform a number of tasks to restore your foundations defenses. Once excavated the walls are power washed so we can easily identify any cracks or gaps. We fill these gaps and cracks with different products based on the makeup of the wall. Once the wall is restored physically we install an adhesive waterproof membrane directly to the wall and cure it with heat. The membrane is 100% waterproof. 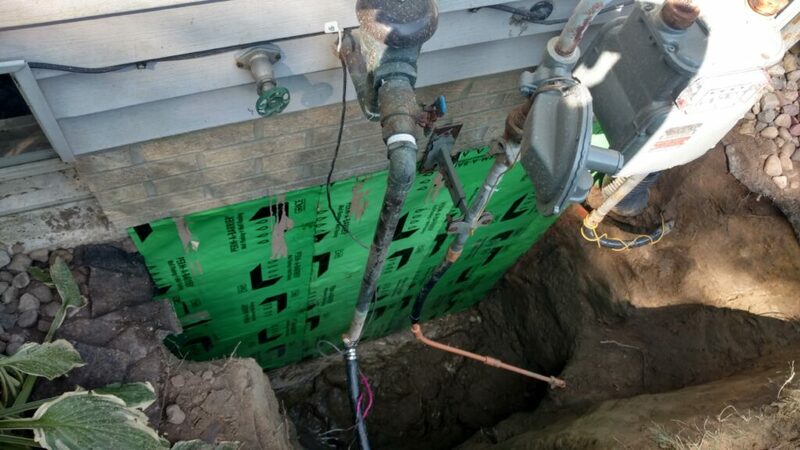 While the foundation is exposed we install new foundation tile on the outside and connect it to the pipe on the inside of the basement. This is done so the water can drain to the sump crock and be pumped out. The pipe is covered in a mesh netting to keep out sediment and debris, it is then buried in #6 stone. Once the work is complete the trench is backfilled making sure the final grade is directed away from the building. A proper Sump Pump and Back-Up System are pivotal in maintaining a dry basement. Please see our Sump Pump Page for full details and to learn about different options offered by Rooter Right. Basement Waterproofing encompasses a wide array of techniques well beyond those mentioned here. The best way to understand the needs of your basement, or crawl space, is to let one of the Professionals at Rooter Right inspect your basement or crawl and provide you with an in-depth analysis of the findings. We have solutions to meet all needs and are equipped and capable of preserving the foundation of, what is likely, your largest investment. Protect your home or business by understanding what it takes to properly maintain it.